One of my beloved activities in the summer is attending local farmers markets. Every Thursday here in Bluffton, South Carolina, people gather in the center of town to pick up produce, fresh seafood & flowers; all of course to support local businesses. Both residents and newcomers come into town in all sorts of transportation ranging from cars to golf carts, occasionally hopping off boats from the May River. Naturally, I had to show off the bouquet of flowers I picked up. 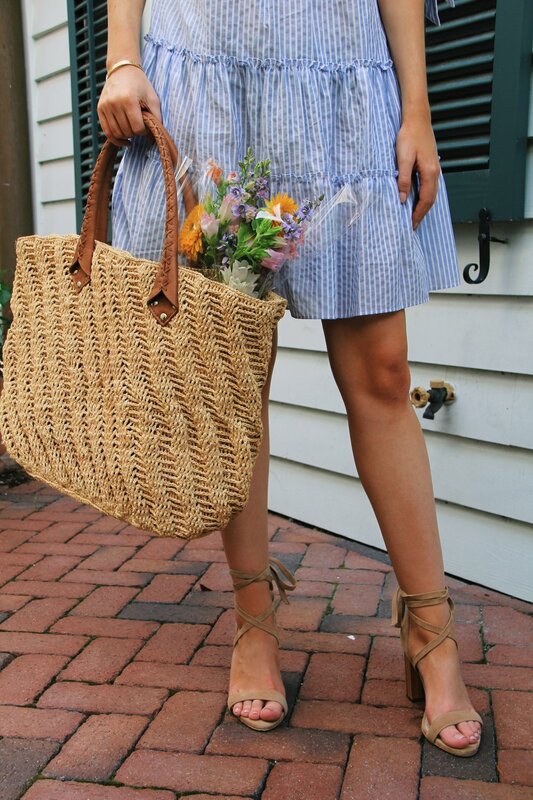 A straw tote is my go-to summer bag, and the perfect way to gather produce. I loved the ruffle detail on this off the shoulder BCBG dress. Not to mention, the blue and white striped fabric! I actually wore these strappy heels to my sorority formal and they were a godsend considering how comfortable they are!